Now that we are finally settled into the new place I can start cooking again! It’s been weeks since I’ve had access to all my cooking stuff. This weekend we explored Forest Hill a bit more. Our new brunch spot has been found, Canvas and Cream. Great bubble and squeak with poached eggs and bacon. As we we’re finishing up the rain stopped so we decided to head up to the farmers market at the Horniman Museum. The market is on every Saturday and it’s literally 5 minutes from our flat. Big bonus. I had never been to the museum before – the views from the gardens are stunning. You have the whole of London out there before you. Can’t wait to head back on a sunny day. The farmers market was good, maybe 12 stalls. But unlike a lot of the other ‘farmers’ markets selling expensive things for your kitchen you are never likely to use but somehow seem to buy (always me! ), there were some great stalls there, in particular two great veg stalls. A whole bag packed with veg for £7! With the change of weather, I was really craving some kind of spiced squash dish. After eating a load of crap for a couple of weeks during the move I’m trying to eat some good wholesome food too. And so this is where this recipe came from. Since going to Climpsons Arch over in my old hood, London Fields, and trying Tomos’ leeks with goats curd, I’ve been wanting to use it in my own food. And so I had to throw this in after seeing it at the market. 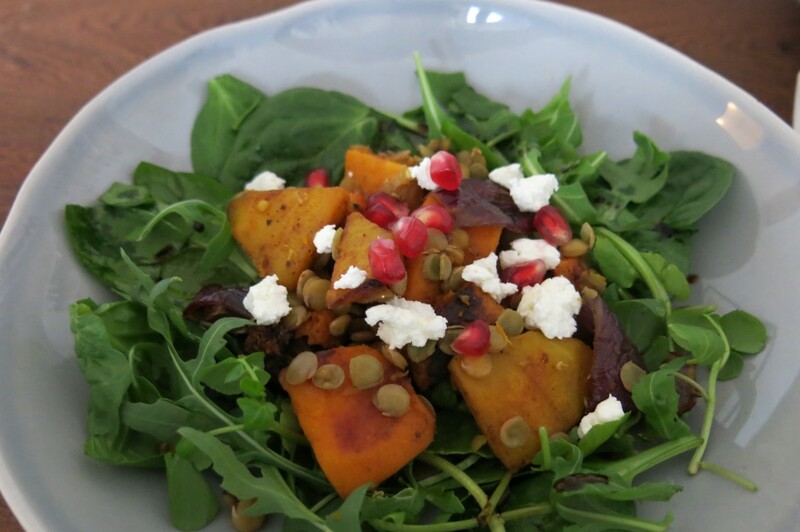 Spiced squash, goats curd and pomegranate – what’s not to like! 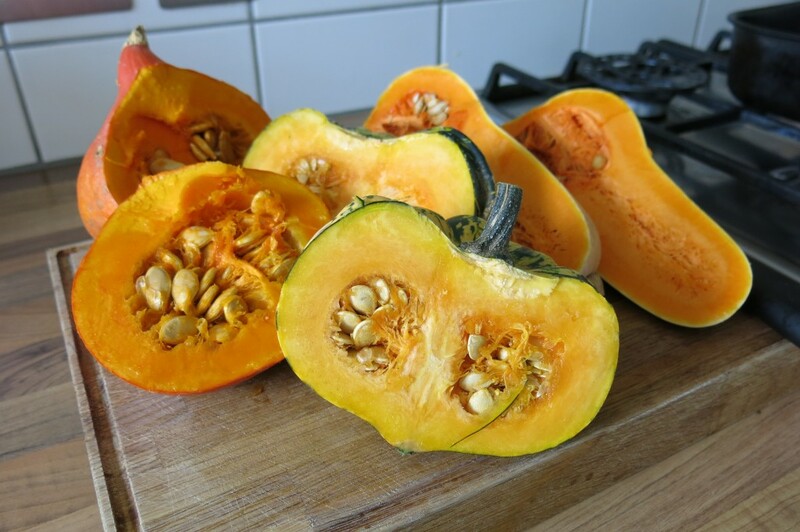 In this recipe I use three different types of squash as they were available at the market. I’ve got the red kuri squash which has quite a nutty flavour and a carnival squash which is mellow and sweet. Using just butternut squash would work perfectly well too. Though most supermarkets have a couple of different varieties at the moment. This will feed 3 to 4 people. Once you have peeled, de-seeded and cubed your squashes (I really hate this job, but think of it as a good work out for your arms! ), add it to a roasting tin. Add enough olive oil to coat and season. Put into the pre-heated oven at 200c for 10 minutes. Mix all your spices together. Add the onions to the squash and sprinkle the spices over – make sure you turn the veg well so that its all coated with the oil and spices and cook for 20 more minutes. Whilst the veg is roasting, cook your lentils as per the instructions on the packet. Keep an eye on the squash – you don’t want it to burn, so you may need to turn it once or twice. Once the lentils are cooked drain them and add to the roasting dish and mix all together. You want everything to be coated with the flavourful oil. Add a handful of salad leaves to your plate and top with a couple of spoons of the squash, onion and lentils. Sprinkle with the pomegranate and goats curd. I just used a little olive oil and balsamic vinegar to dress the salad. 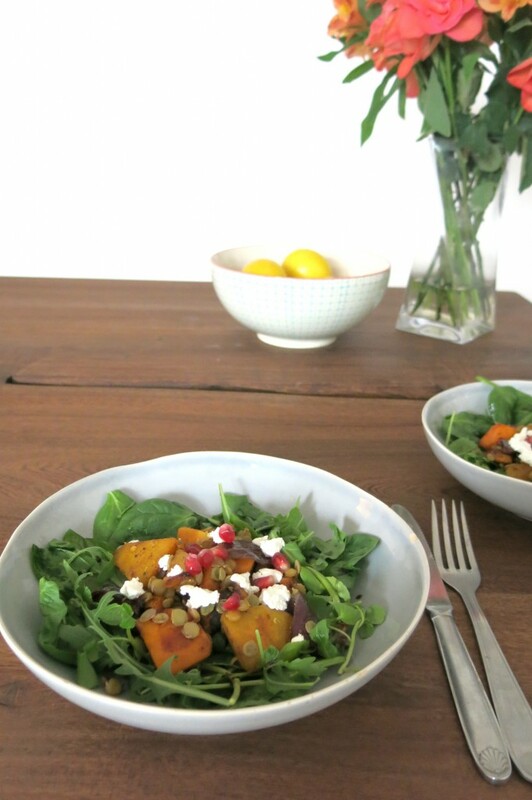 You can have this salad hot or cold and any spare roasted veg can be used the next day too. This is such a simple, warming salad. Full of lots of those much needed vitamins for this time of year, its healthy too. You may be thinking what I did with the other halves of all the squash – they went into a soup which I shall be sharing with you soon!